Last month my friend Matt bought me a Trangia Kit. Now that's the sort of thing a nice friend does. Another sort of thing that a nice friend does is buy me a Hilleberg Nallo tent. Just saying, Matt. Anyway, I've used propane, butane/propane, and naptha stoves - and built some pop can alcohol stoves, but had always wanted a Trangia to try out. What I got was a mini Trangia Kit - stove, windshield/pot stand, 0.8 litre aluminum pot, 15 cm non-stick aluminum lid (suitable as a frying pan), and a little pot gripper. The whole kit weighs in a 330 grams, or 3/4 lb (12 ounces). One chilly morning I took James out for a walk in his stroller. I brought an unimaginative meal with me, but something that would prove to be quite tasty in the cold morning air. A Mr. Noodles Bowl contains pre-cooked, dried noodles, and soup powder. You just add boiling water to reconstitute the noodles, seal the lid for a few minutes and you are ready to chow down. The set up is rather neat - the stove fits in a formed aluminum windshield and pot stand combination. There is a ridge on the bottom of the pot that fits nicely on the pot stand prongs. A ridge on the top side of the lid lets you flip it over and pop onto the top of the pot. Everything stacks up nicely within the pot, and I include a Light My Fire scout ferrocerium rod to start the flame. I use a Nalgene mini-bottle to store the methanol or methyl hydrate that I use for fuel - I buy this in 1 gallon plastic containers at the local home builder shop (Home Depot or Lowes in Canada). The brass construction of the stove is nice - you fill the stove up about half way with alcohol. This then migrates through baffles in the floor into the empty walls. Once you get a flame going, the walls heat up, and pressurize the methanol, which forces a jet of methanol vapour out of the pin holes - which in turn become jets of blue flame. The top of the stove is sealed with a lid containing a rubber-compound O-ring. This allows you to store some alcohol within the stove. Just be careful never to replace this lid until the stove has cooled to the touch, or you might melt and mess up the seal. There is another piece to the kit, roughly the size of the lid, called a simmer ring. This has a manual sliding sheet that you can open and close until just enough flame comes out to simmer a pot. This is pretty useful, given how powerfully the stove can flame. It took about 3 minutes for the pot to boil. Or something like that. Sometimes a longer wait is nice - they say if you get lost in the woods, stop and make a cup of tea. Fidgeting with making a stove or fire go warms your hands, distracts you from the building sense of panic or fear of being lost, and helps you orient yourself by spending some static time where you have found yourself. When I spend time in some shapeless woods, and just sit there for a while without focusing too much, the intricacies and specifics of the environment begin to leap out at me. I begin to recognize a water course, some dead fall firewood hung up in a tree, some flaking birch bark for tinder, some sedges or berries or mushrooms that I can eat. The sound of a squirrel or the rushing of a stream. Just sitting and making a cup of tea (or in this case, a cup of noodles). I intend to buy another kit for the car safety kit. I wouldn't necessarily bring this with me on a longer camping trip, or a solo, but it would be great on a day or weekend hike. 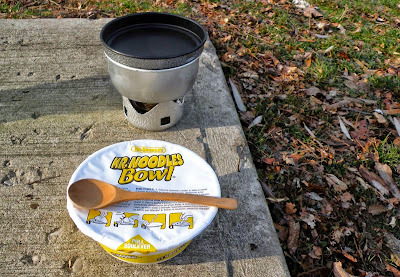 It doesn't burn as long or as hot as my MSR Dragonfly stove, but transports nice and cleanly. I carry it in a purple bag that I got from a whiskey bottle that someone gave me. Mungo Says Merry Christmas, Happy Holidays, Happy New Year to All! Well, another year has scooted past and what a year it has been. We were at the hospital last January and all of a sudden a bunch of green clad doctors said 'Here' and presented us with a visitor. I snipped his umbilical cord, and Spring revived from surgery and held him closely. His name - we decided - was James Ozan. He has been an incredible joy to be with. This experience has woken me up and Spring is learning to live with a better fellow - I hope. In less than a fortnight we'll be celebrating his first birthday. I think a very basic bushcraft kit for him - some string, a pot, a spork, a bowl and maybe a compass. I'll make him a little woolen jacket from a blanket. Spring makes an appearance in the photograph above - she's the one attached to the hand feeding James. As you can see, she is looking healthy and happy, and will be returning to work in the new year. Mixed feelings about that. James is going to daycare - a really nice place. The winter is upon us now - the Winter Solstice arrived a couple of nights ago. This means fires in the valley and a chance to sleep in the woods. I will need to bribe Spring to allow me out to do this. I will go with a minimum of kit. It will be good and I will document it. But until then, we all wish you Happy Holidays, and Happy New Year. Stay warm by a fire or under a wool blanket and remember Of Each Other We Should Be Kind While There Is Still Time. The other night I was cleaning up my Carbon Steel Mora with a bit of fine sandpaper - the metal tends to discolour with regular rough use. The surface became nice and clean, nice and shiny, but I wanted to try to keep the surface protected. In lieu of spraying it with messy WD40, I thought I would oxidize the surface to get Black Rust to create the result known as Bluing. Creating Black Rust (magnetite Fe3O4) is known as bluing - a process in which steel is partially protected against Red Rust, and is named after the blue-black appearance of the resulting protective finish. Black rust effectively coats the iron/steel and prevent oxygen from reaching the underlying metal. The red rust you normally see is (Fe2O3). Previously I have spread regular mustard onto the blade, wrapped it all in plastic food wrap, and left it overnight. Being somewhat worn out after work, and thinking about the 10 stairs I would need to ascend to reach the mustard in the kitchen, I decided instead to grab some vinegar from the cold room in the basement and fill a Nalgene partially with a 50/50 solution of vinegar and water. I put the knife up to the hilt in the liquid and left it for 36 hours. I took it out, wipped it with a paper towel and lo and behold I had a nice, rich looking patina. My fingerprints were evident in the coating - next time I will clean the blade with a bit of methanol etc... prior to treating it. Although I didn't take any photographs of the metal prior to treatment, I am comparing it with a laminated steel Mora (the blade contains rich carbon steel in the middle - hardness about 59/60, sandwiched between slightly tougher, lower carbon steel laminate strips).